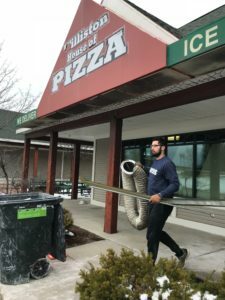 Domino’s co-owner Stefan Radan disposes of elements of the former Williston House of Pizza on Tuesday to make room for a Domino’s restaurant. 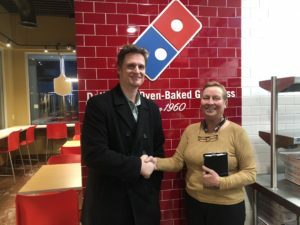 Domino’s owner Mike Litwhiler worked with real estate broker Esther Lotz to find a restaurant spot on Cornerstone Drive. The traditional image of a Domino’s Pizza restaurant is a delivery/takeout operation with just enough space for customers to make a transaction at the register. The store opening in Williston in May won’t be a traditional Domino’s. Located in the former Williston House of Pizza space on Cornerstone Drive, this Domino’s will feature in-store seating and an open design that gives customers a view into the kitchen. Mike Litwhiler, whose family has been a Domino’s franchiser in northern Vermont for decades, will own the restaurant with his son, Stefan Radan. It will be the family’s seventh location. “For the longest time, I heard constantly ‘when are you going to open a store in Williston?’” said Litwhiler, who grew up in Underhill, graduated from Rice Memorial High School and now lives in South Burlington. “The timing was right, and we are finally getting it done. Although Domino’s and the Williston House of Pizza sell the same primary product, none of the equipment or furniture has survived the transition. Radan and Litwhiler are gutting the place and plan a complete makeover. Of the family’s seven restaurants, only three have a dine-in component. Domino’s rolled out dine-in restaurants about four years ago, Litwhiler said. “Traditionally, Domino’s has been all about delivery, but they have really changed,” he said. Commercial real estate broker Esther Lotz helped Litwhiler find the Cornerstone Drive location.